NOW: Jean Sherrard’s repeat is part of a collection of other contemporary views of historical theatre sites he has recently recorded for what will be the first temporary exhibit of the new MOHAI when it opens later this year. 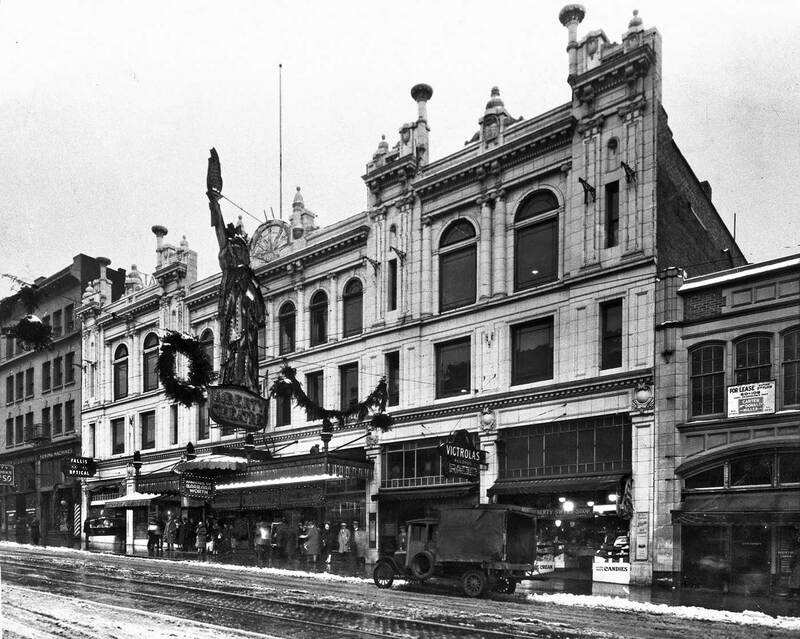 I first learned of the Wilkes Theatre from Seattle’s silent film expert David Jeffers. Typical of David, his research on the Wilkes is thorough, and I was tempted to simply quote extensively from his recent letter. I will, however, dwell instead on some implications of this Webster and Stevens studio photograph that looks south over Pine Street at the Wilkes’ full-facade at the southwest corner with 5th Avenue. It was Jean Sherrard, my cohort in this feature, who first showed it to me. Let us remember that another collection of Jean’s photography of contemporary Seattle is still up as part of the last “temporary exhibit” at the now soon to be old MOHAI. In case you have forgotten – or not visited it yet – its name is “Repeat Photography” and it was first curated early last year by Jean, Beranger Lomont and myself. It will be waiting for your visit until the fifth of June. 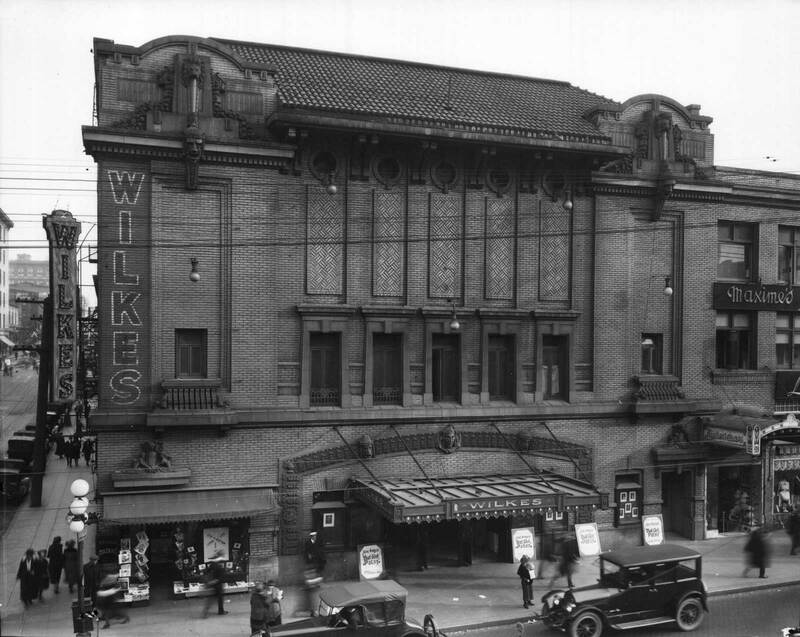 In the summer of 1922 the Wilkes became a venue not for film or theater but for political rallies and other temporary uses like worship for the Fourth Church of Christ Scientist. Next, in 1923 the corner began its long history of selling women’s finery. Yes Jean and most of it nearby, beginning with a feature on Westlake’s 5-star corner that was the first now-then feature I wrote – and assembled – for Pacific. It appeared first on January 17, 1982. Frankly, it seems like that long ago too. Fireworks at the Times Building represented literally the figurative fireworks that found expression in every other event of the dizzy program which piled sensation on sensation until the city’s homecoming soldier sons admitted they scarcely knew whether they were coming or going . . . “From the roof of the Times Building rockets soared screamingly upward and flared out in fantastic shapes and lights and showers of fire . . . Meanwhile bands – four of them – were making the night melodious with war tunes and the jazziest of jazz music – and throngs were dancing, looking skyward as they danced, and not bothering to apologize for bumps.” It is doubtful that even Gladys Brockwell’s melodramatic heroics could soar so high. 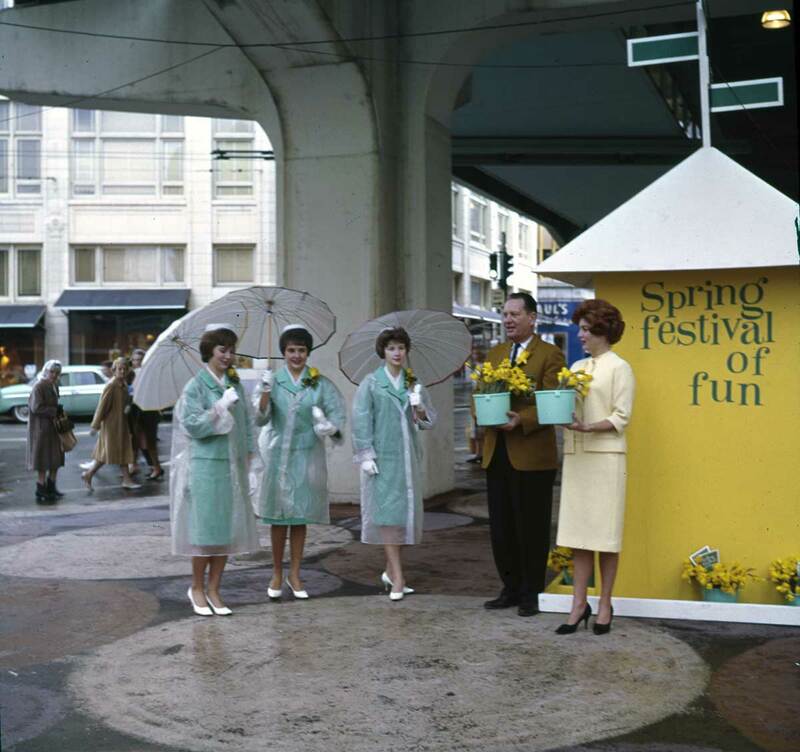 The Spring Festival of Fun was designed to bring shoppers into the central business district.. Frank Shaw snapped this on May 14, 1964 at the Westlake end of the Monorail. 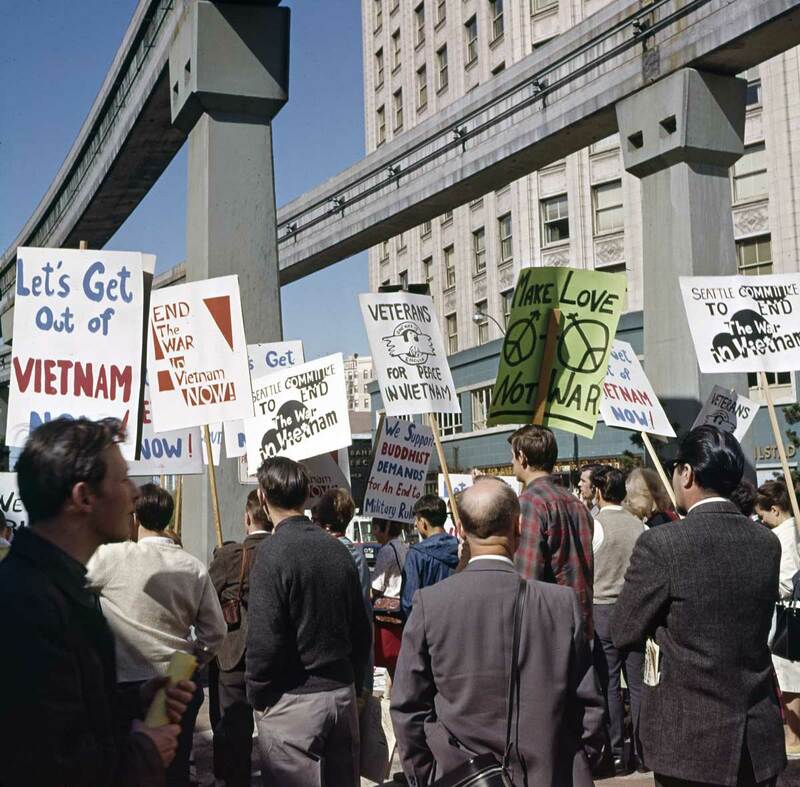 Two springs later Frank Shaw returns to record a Vietnam protest on May 16, 1966, also near the Westlake terminus for the monorail. Our historical setting dates from 1909. All of the larger structures are new and seem to elegantly promise that this unique hub will develop into Seattle’s 20th-century civic center. On the right is the Seaboard Building, which now, with another five stories added, still fills that comer. Just beyond it is the American Hotel, and across Westlake, the Hotel Plaza. The flatiron Plaza stood there until 1931 when it was razed to the first floor level and rebuilt more modestly for Bartell Drugs, which remained a tenant for over 50 years. During the prohibition years a cabaret in the Plaza’s basement was one of the town’s more popular speakeasys. In our 1909 scene (on top) only a few horses, hacks, and three or four automobiles are at play. The streetcars and people actually own the street, and the former are outfitted with cowcatchers to mercifully ensnare the latter. In 1909 if you stayed off the tracks (and stepped about what the horses left) you were usually free to safely jaywalk or even stand about and converse in the street – like the two men on the right of our scene. To contemporary eyes the oddest feature of this cityscape is surely Fourth Ave.’s ascent up the southeast flank of Denny Hill. 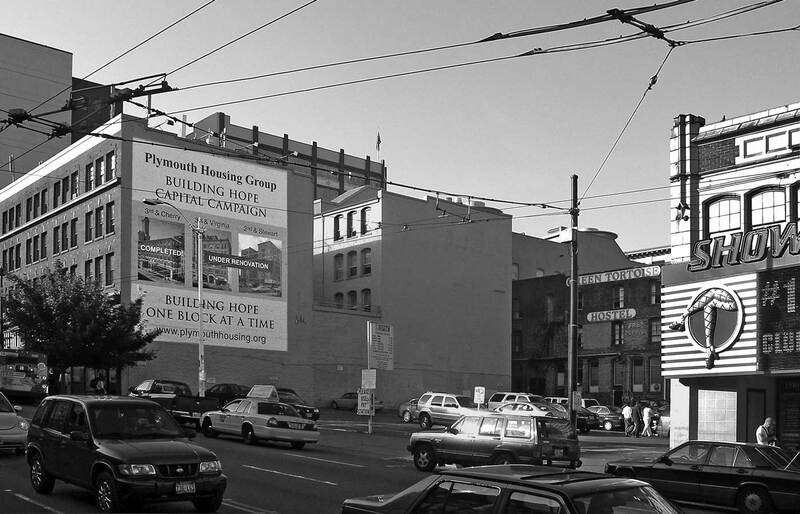 There is a grade difference of 85 feet between our “now” and “then” at Fourth’s intersection with Virginia St. – point we almost see on the photograph’s far left. Within a year and a half this hill would be leveled to the non-descript elevation we are now used to. The Pike Street part of the narrow-gauged coal railroad runs, left-right, thru the center of this ca. 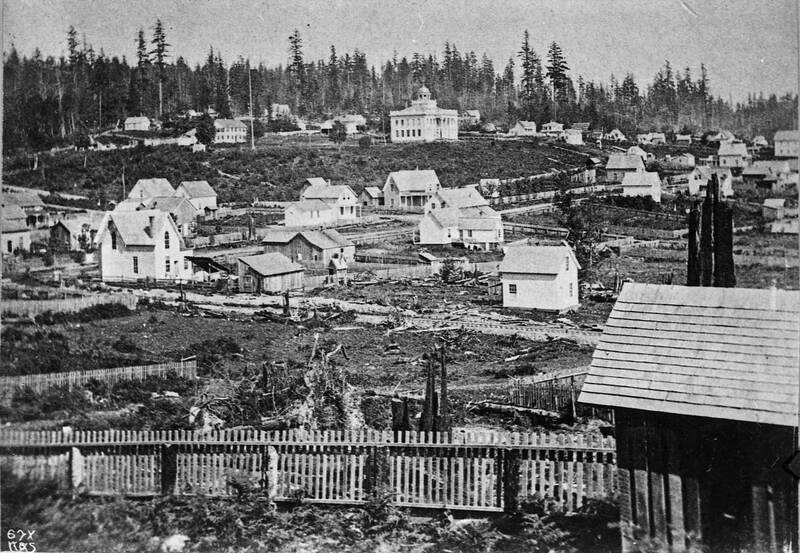 1873 look from Denny Hill towards the territorial university on Denny's Knoll and First Hill beyond it. 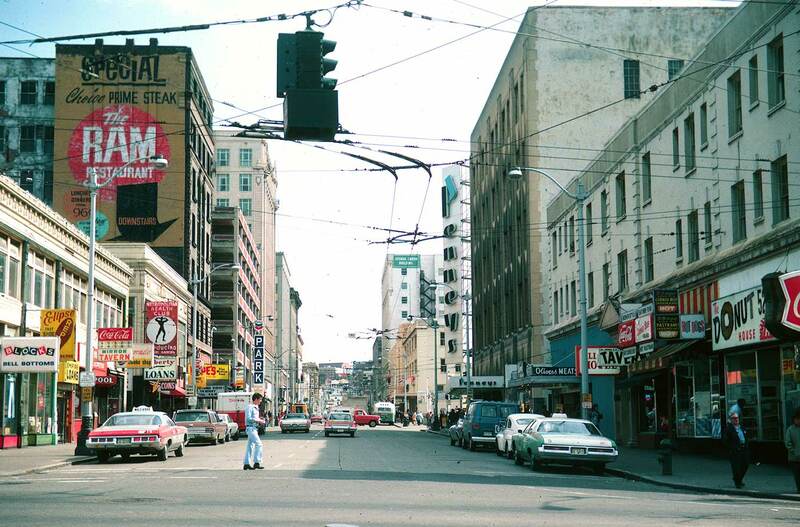 The intersection of Third Ave. and Pike Street is far left - some of it. In 1882 a narrow boardwalk to the lake was built along the old line and David Denny’s Western Mill first started Lake Union “working.” By the late 1880s the sides of this little valley between Denny and Capitol hills were cleared; however, the streets which were cut across this gentle ravine did not conform to the lay of the land. The district of clapboard apartments and working men’s homes which developed here was one of Seattle’s more obvious examples of the tendency of promoters’ town plats to disregard the real topography. 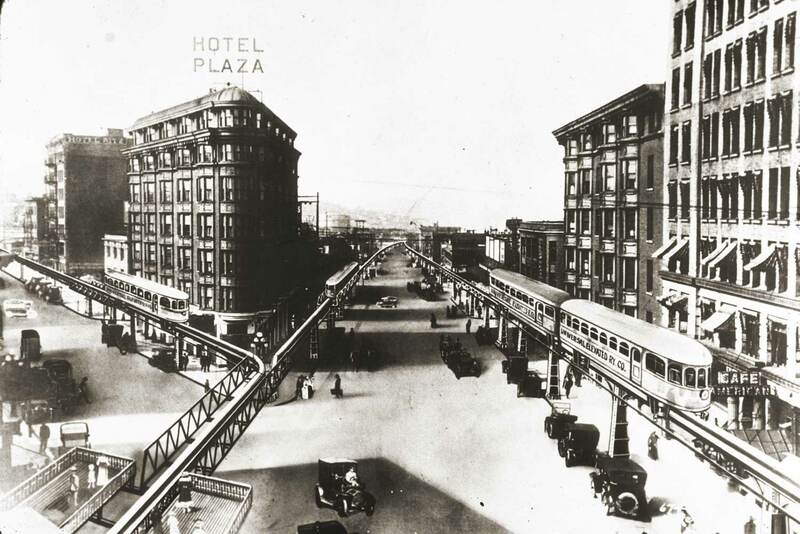 In 1890 Luther Griffith, Seattle’s young wizard of electric trolleys, realized this mistake in city planning. After buying up 53 lots along the old coal road’s grade, he proposed to cut a multi-use boulevard through to Lake Union. The city council disagreed. 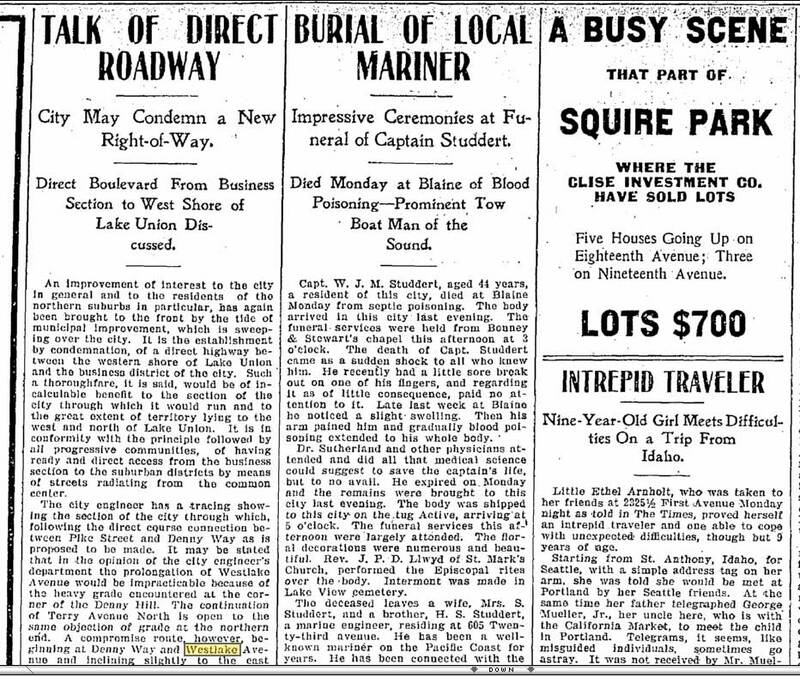 March 6, 1901 Seattle Times report on the plans for cutting Westlake directly thru from Pike Street to Denny Way. 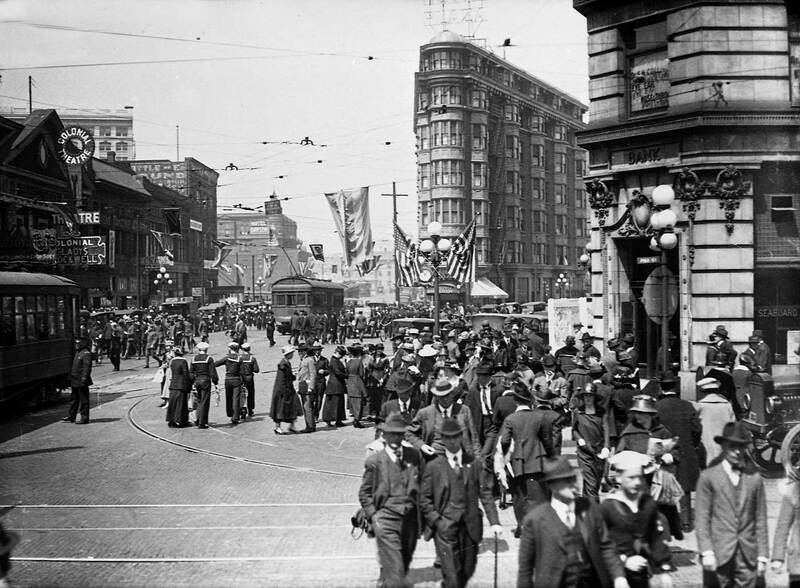 By the early 1900s the city’s businesses had begun to move north out of Pioneer Square. A new city center was desired, and the city engineers went back to the old Westlake proposals. The old route was surveyed in January 1905, and by November of the next year the 90-ft-wide street was paved and completed. This was 30 years since Mayor Weed’s original 1876 proposal. An early imagined monorail at Westlake. The monorail terminus to the side of Bartells. 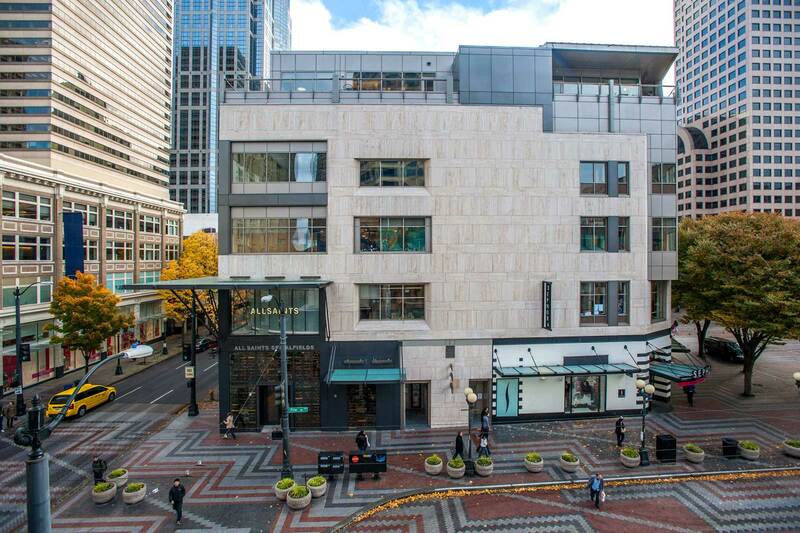 If this Westlake precedent holds true, then the Westlake Mall, which was first proposed in 1958 and has since been a frustration for five mayors – Clinton, Braman, Miller, Uhlman, and Royer – should be completed in 1988 to the glory of the reelected fifth. A "found" (unintended) near "repeat" from 1995. Although the date for this Fourth and Pike scene is recorded on neither the original negative nor on its protective envelope, uncovering it was not difficult. The newsstand at the center of this view includes face-out copies of both The Seattle Times and The Post-Intelligencer. Although we can’t read the date, we can, with the aid of magnification, make out a few of the headlines in the original negative. With those generous clues and a little fast-forward searching through the Seattle Public Library’s microfilms, the date for this scene is soon discovered. It is Monday, July 25, 1938. The P.I., just above the dealer’s head, announces “A New Forest Fire Rages at Sol Duc.” A week-and-a-half of record heat had not only encouraged fires but also filled the beaches. And this Monday, Seattle was even hotter with the anticipation of a Tuesday night fight. Jack Dempsy’s photograph is on the front page of the P.I. The “Mighty Manassa Mauler” was in town to referee one of the great sporting events in the history of the city: the Freddie Steele vs. Al Hostak fight for the middle-weight title. About 30 hours after this photograph was taken, hometown-tough Hostak, in front of 35,000 sweating fans at Civic Field (now site of the Seattle Center stadium), made quick work of the champion Steele. The P.I.’s purple-penned sports reporter, Royal Brougham, reported “Four times the twenty-two-year-old Seattle boy’s steel-tempered knuckles sent the champion reeling into the rosin.” Hostak brought the belt to Seattle by a knockout in the first minute of the first round. 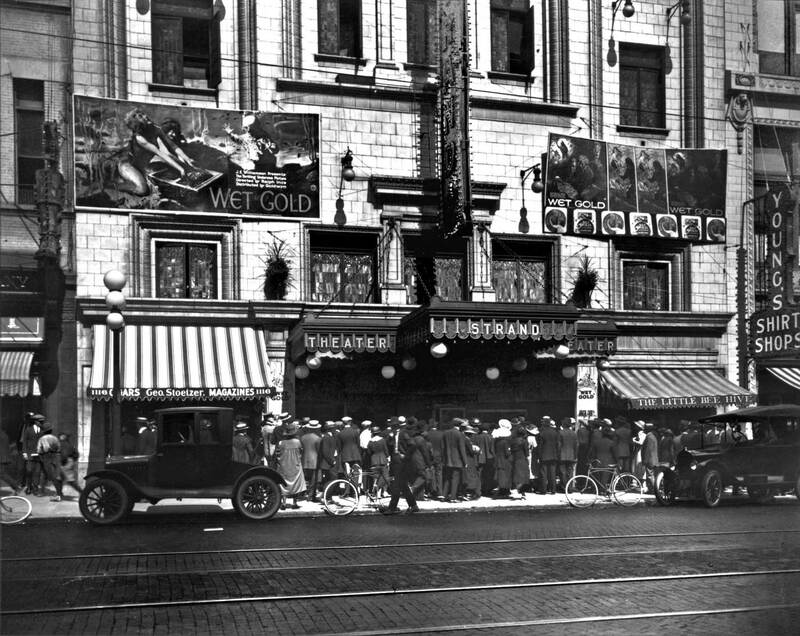 The day ‘s super-heated condition was also encouraged at the Colonial Theatre (one-half block up Fourth) where the Times reported that “an eternal triangle’ in the heart of the African jungle brings added thrills in “Tarzan’s Revenge.” The apeman’s affection for a Miss Holms, on safari with her father, fires the resentment of her jealous fiancee, George Meeker. However, we will not reveal the ending to this hot affair, although by Wednesday the 27, Seattle had cooled off. 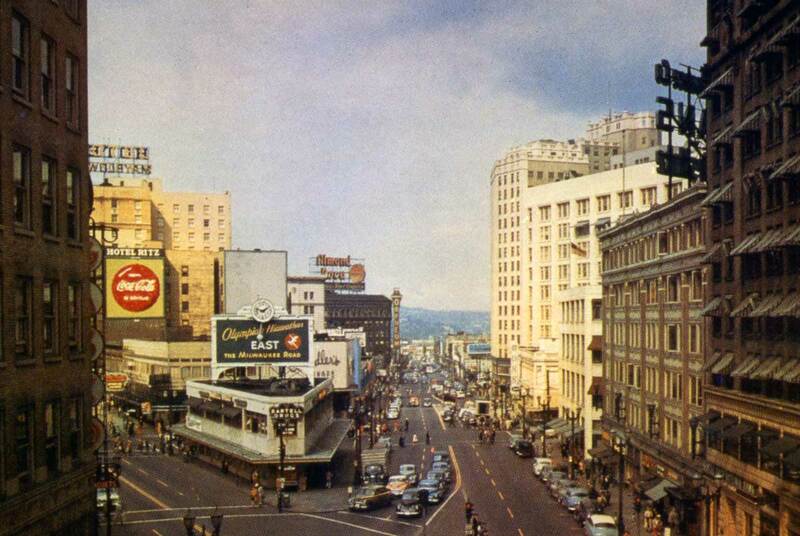 Both views look north on Westlake from its origin at the corner of Fourth Avenue and Pike Street. 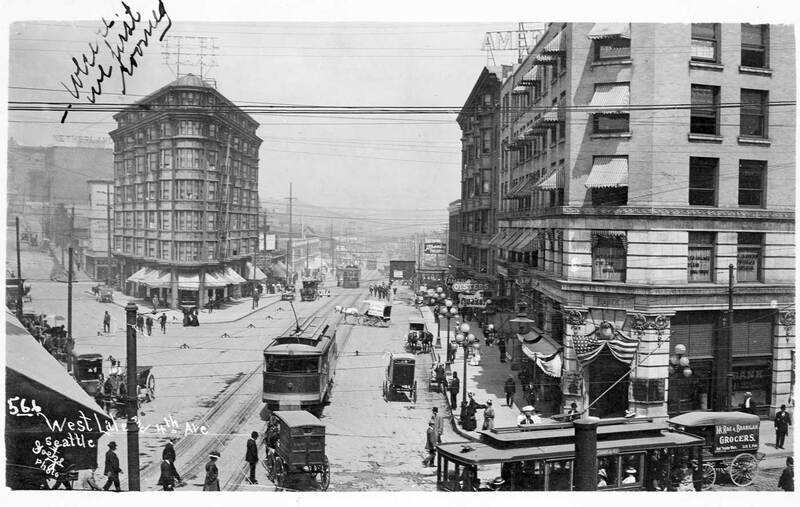 The Seaboard building, on the far right, has survived the about 95 years between them. I confess to having featured this intersection four times – that I remember – in the last 23 years. So here’s the fifth, and I wonder what took me so long. 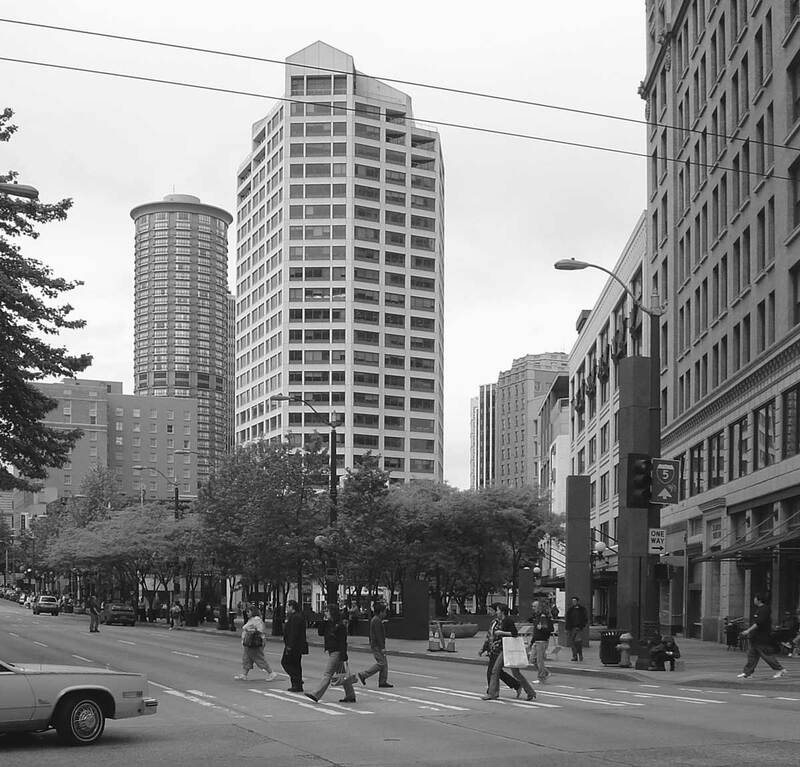 There are so many delightful photographs taken from this five-star corner looking north on Westlake from Forth and Pike. But this scene with the officer probably counts as a “classic” for it has been published a number of times and he has not tired. It is only recently that I looked closely at the policeman, and I think I have figured out what he is doing. He is scratching his head. Since this is a sign of deep thought – or at least puzzlement – I suggest that the officer here is wondering about the great changes have occurred in the only three years before he was sent this afternoon to help with the traffic. (I’m figuring that this is 1909 or very near it.) 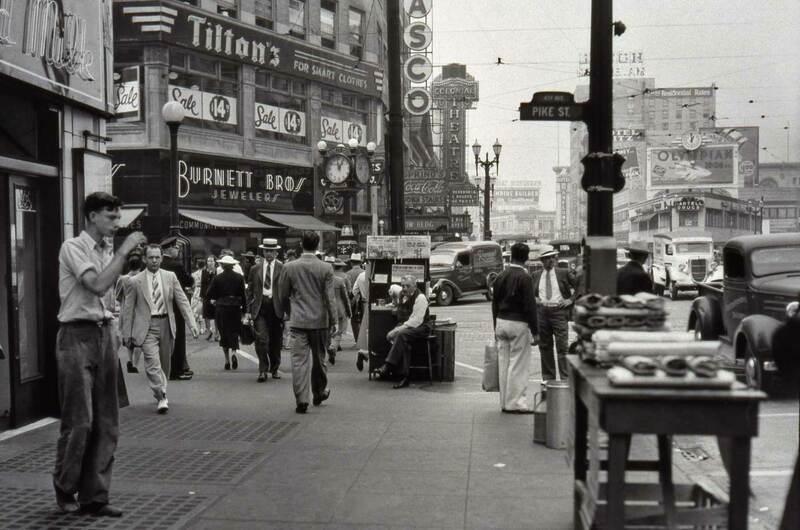 Heading north for Fremont, trolley car number 578 – to the left of the officer – is only two years old and so is the Plaza Hotel to the left of it. If the officer returns to this beat in a few years more he’ll probably know that there is a speak-easy running it the hotel basement. But then some readers will remember that there have been many magnificent plans for this part of Westlake as well. 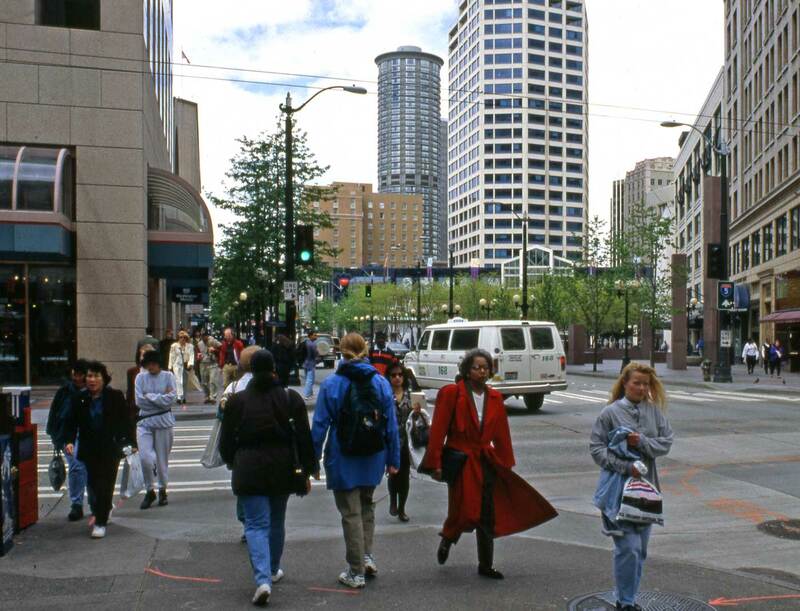 Beginning in 1960 with the opening of the Westlake Summer Mall — that quickly had its name changed to Seafair Mall — the blocks between Pike and Stewart streets were talked and dreamed over for a quarter century as the best available site for developing a civic center with a wide broad public place for a central business district that somehow wound up without one. 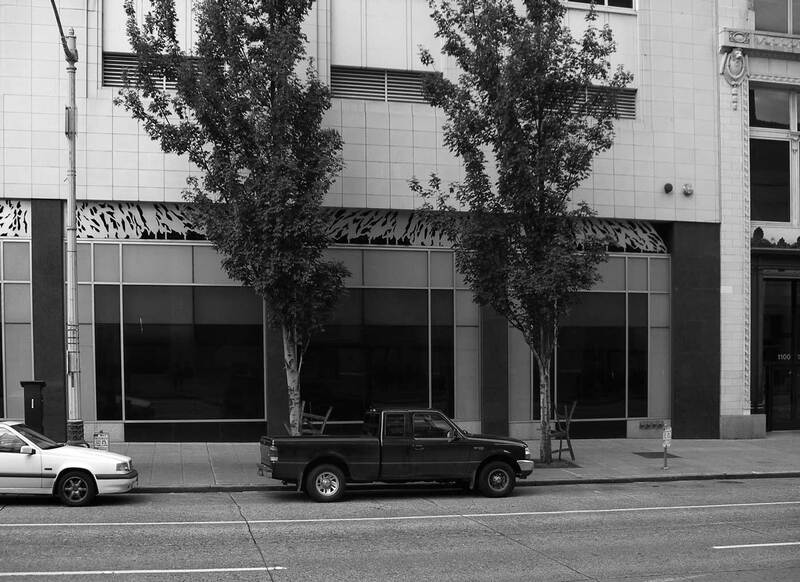 In 1960 one concerned person described the Seafair Mall as “This sorry little bit of pavement with a few planter boxes.” Forty-five years later there are many more planter boxes. A part of the Baillaergeon-Pacific Security Building, far right, survives into the “now” scene. Built in 1907, it is, for Seattle, an early example of a steel-frame structure covered with terra-cotta tiles and ornaments. Most likely this is a first run showing of J. Ernest Williamson’s 1921 hit Wet Gold, the story of a sunken ship, its gilded treasure and the passions released in finding it. Resting nicely on the theatre’s terra-cotta skin, the film’s sensational banners are nestled between the Strand’s classical stain glass windows. Williamson became a pioneer of undersea photoplays by attaching an observation chamber to an expandable deep-sea tube invented by his sea captain father. The younger Williamson called it his “Photosphere”. 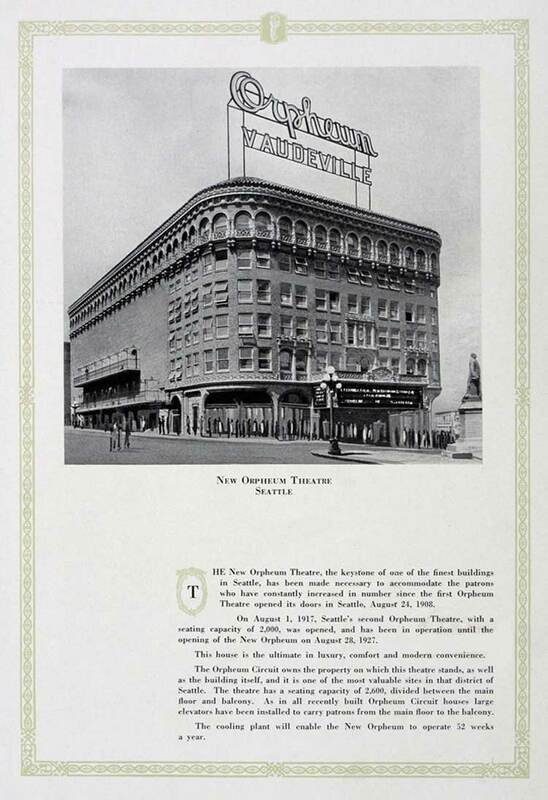 I’ve learned from Eric Flom’s historylink.org essay on the Alaska/Strand that Frederick & Nelson Department Store was contracted to furnish and decorate the interior and that the elegance begun on the street was continued in the theatre’s lobby with onyx and marble. Before the 1927 introduction of synchronized sound the silent films shown at the Strand were generally accompanied by its Skinner Opus No. 217 pipe organ, which later wound up in St. Paul’s Episcopal Church in Bellingham. More than a century separates these two looks east up Pike and across First Avenue. 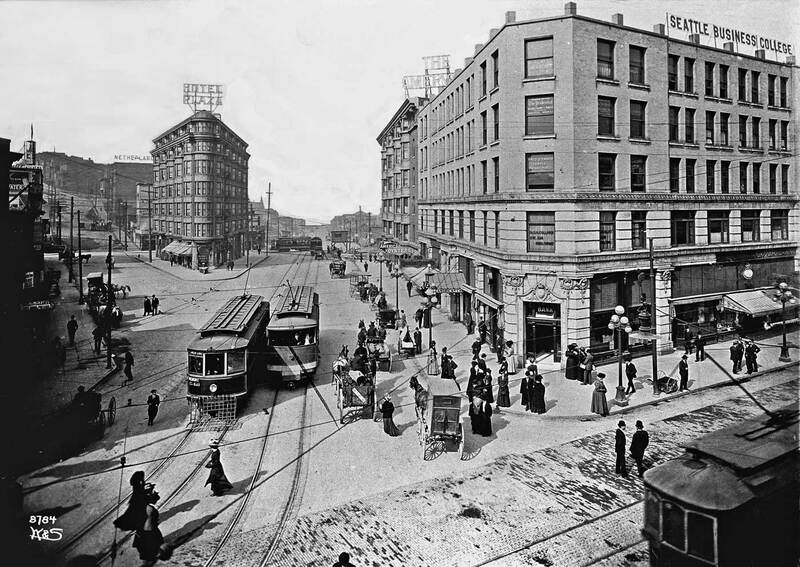 In the first block before Second Avenue among the shops on the left are a tobacconist, a beer hall, a tailor, and two restaurants, the Boston Kitchen and the Junction Restaurant. On a sidewalk sign the latter offers “Mocha Java Coffee.” Historical photo courtesy Lawton Gowey. 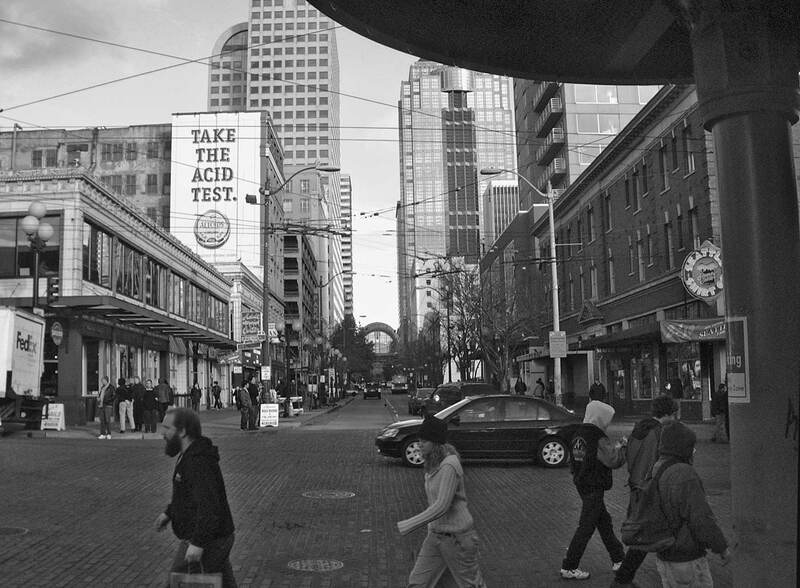 Standing at the entrance to the public market in the crosswalk on the west side of First Avenue and looking east up the centerline of Pike Street – like in this week’s “now and then” — you may imagine trains rolling directly through you and also under you. And while you may no longer see them they can still be felt. The once popular Seattle historian-journalist J. Willis Sayre explains why in “This City of Ours” his entertaining book of Seattle trivia that was published for Seattle Schools in 1936. Describing a tour on First Avenue he writes, “Now lets go down to Pike Street. Here you are directly above the Great Northern tunnel built under the city in 1904.” Today, if you are sensitive and wear wooden shoes (preferably) you can still feel the rumble below. The choo-choo-coming-at-you through most of the 1870s was Seattle’s first railroad, the narrow gauged train that carried coal cars transferred from scows on Lake Union to bunkers at the waterfront foot of Pike Street. This historical view east on Pike was recorded a few years before the tunnel was built beneath it – sometime between 1897 and 1900. One block away the trolley turning west off of Second Avenue onto Pike carries a roof banner advertising the sale of Gold Rush outfits at Cooper and Levi’s in Pioneer Square. 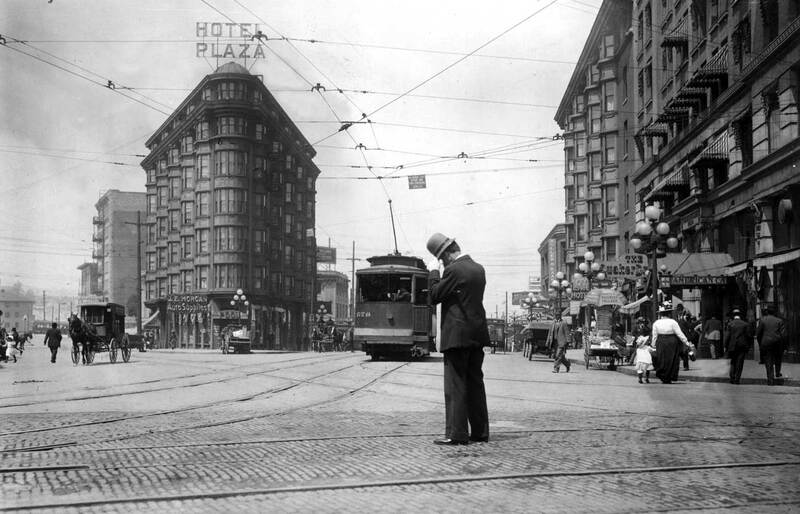 That national hysteria began in ’97, and in 1901 the rails for the Front Street (First Ave.) Cable Cars were removed. 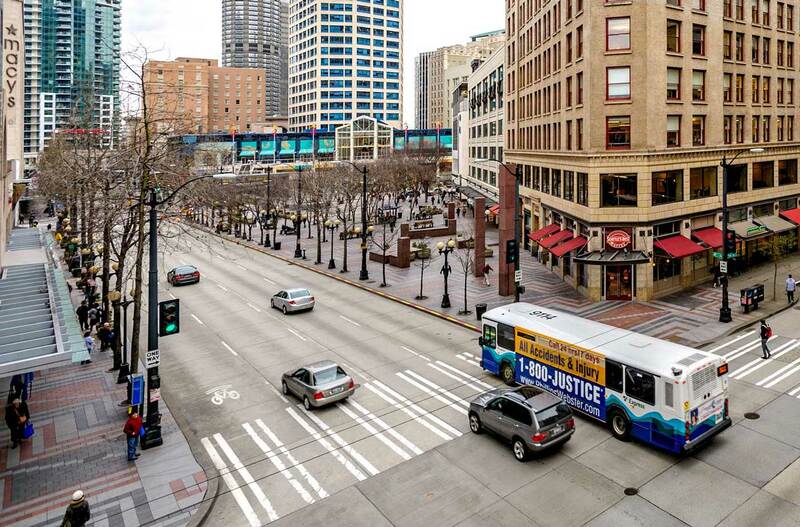 Here on the right they still take a right turn to Pike from First Avenue. 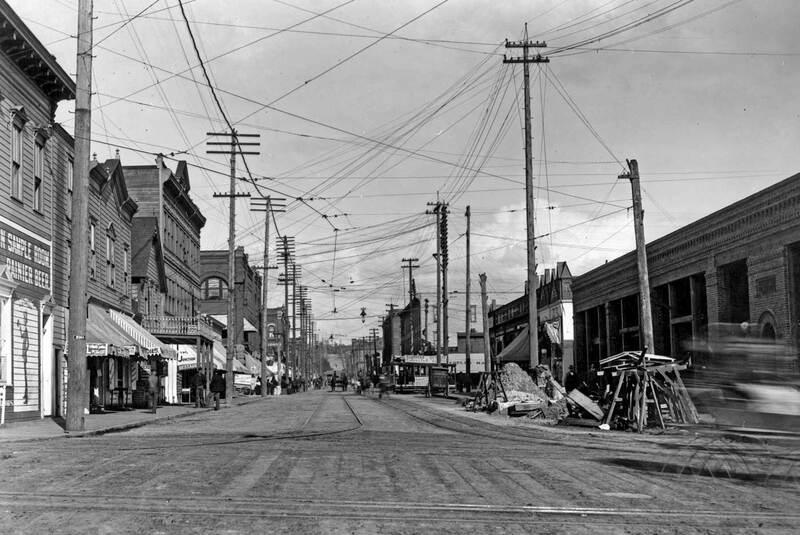 But here in the late 1890s a momentarily silent Pike is paved with bricks, although First Avenue is still planked. One block away when the tunnel was being built the public works department made it’s by now oft-sited traffic count at Second Avenue. 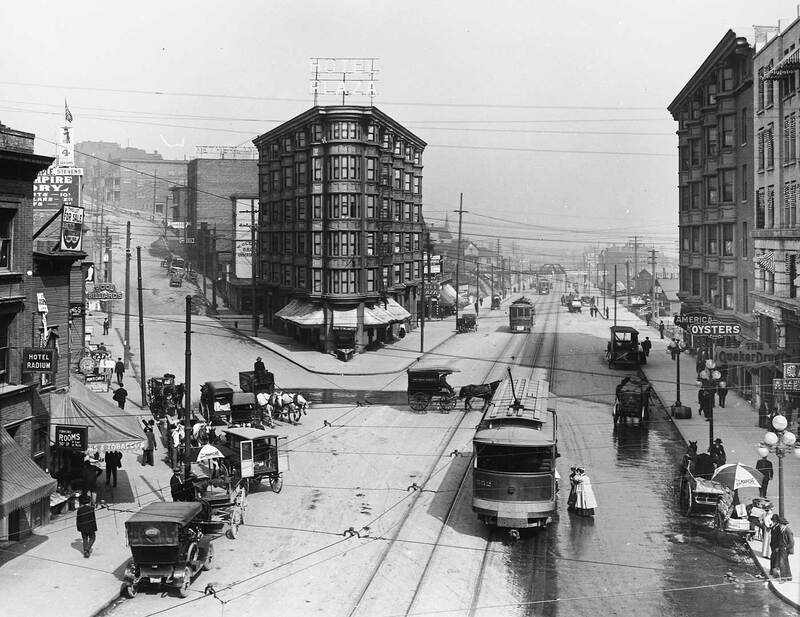 Of the 3,959 vehicles that used that intersection at Pike on Friday Dec. 23, 1904 only 14 were automobiles and 178 buggies. More than three thirds were one or two horse express wagons. 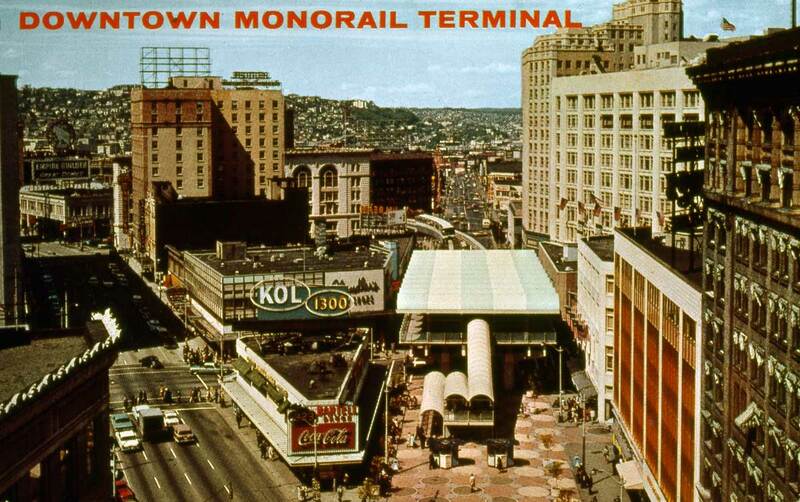 Walking and public transportation – trolleys — were the way to get around. April 21, 1976. Photo by Lawton Gowey. 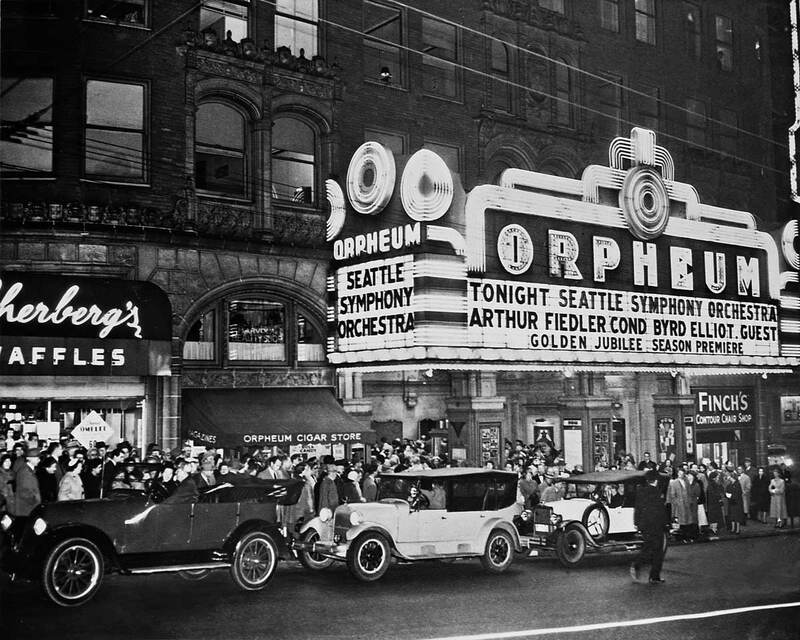 In the late summer of 1953 the officers of the Seattle Symphony began the promotion of the orchestra’s golden anniversary with a public campaign to discover “Where were you on the night of December 28, 1903?” The night Harvey West directed the Seattle Symphony’s first concert in the ballroom of the Arcade Building at Second and Seneca. West got his start playing second violin in pit orchestras for local theaters. His widow was invited to the 50th anniversary concert but could not attend because of illness. 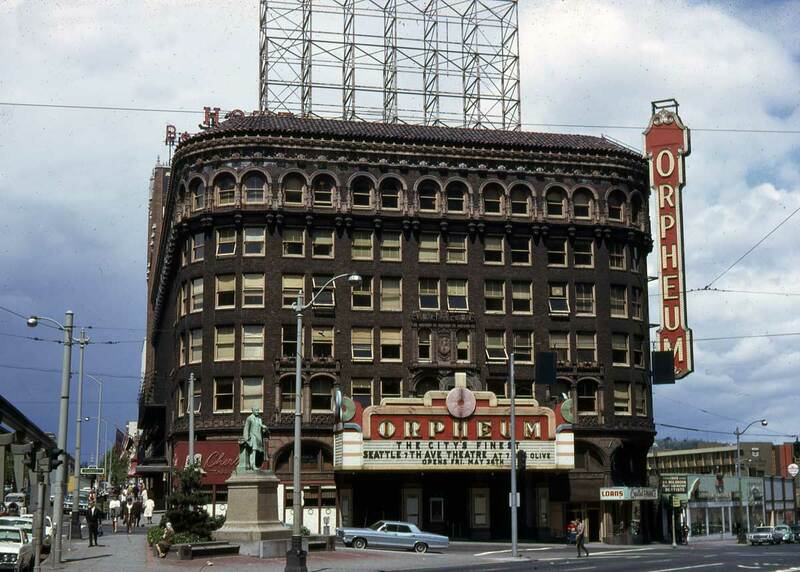 But others who were there in 1903 either as players or payers did answer the call, and were delivered beside the neon lit marquees of the Orpheum Theatre aboard the vintage autos of the local Horseless Carraige Club. Boston Pops’ Arthur Fiedler guest conducted the Seattle Symphony for this November 3rd concert, and local virtuoso violinist Byrd Elliott was featured with Prokofieff’s Second Violin Concerto. Fiedler’s program also included Beethoven’s First Symphony, Handel’s Royal Fireworks Music and an encore of The Stars and Stripes Forever. Fiedler explained that he rode this old horse “for fun” because of the 50th-anniversary celebration. Of course the Orpheum was filled to its 2600 seat capacity. The caption for the trio above is printed below. As an antidote, perhaps, the Symphony’s first post-war conductor Carl Bricken found cultural encouragement in the doomsday peace that followed Hiroshima. 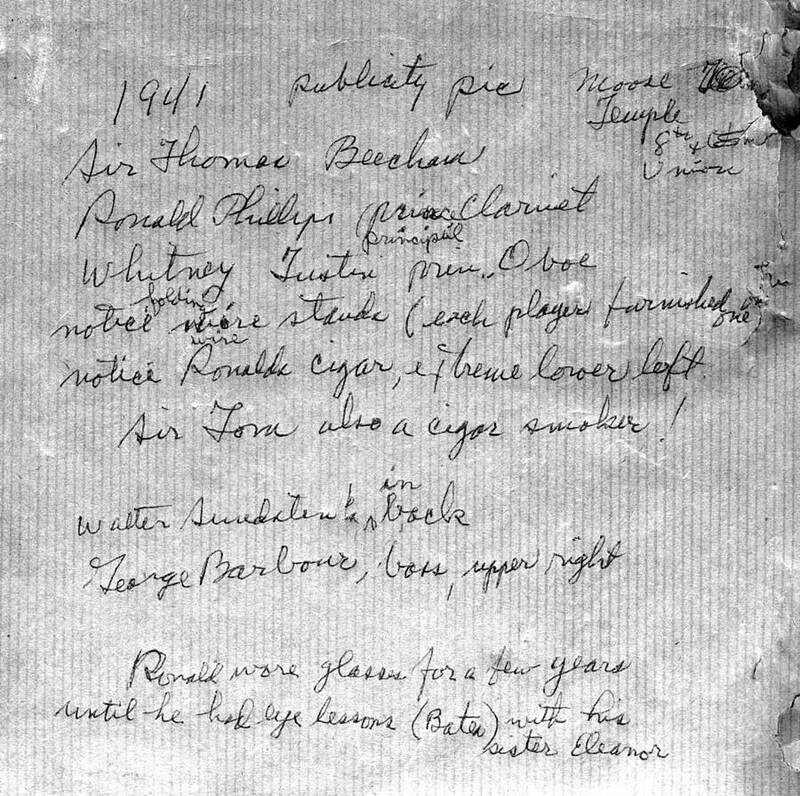 Perhaps, he mused, “a new era is beginning…that people the world over…dazed by the known element of complete annihilation, are ready for a millenium of the peaceful pursuit of the sciences, arts, literatures and music.” However, after Bricken resigned in 1948 the Symphony’s musicians soon abandoned its officers, formed their own Washington Symphony League and scheduled a season of 16 concerts at the Moore Theater with a conductor of their own choosing, Eugene Linden of the Tacoma Symphony. 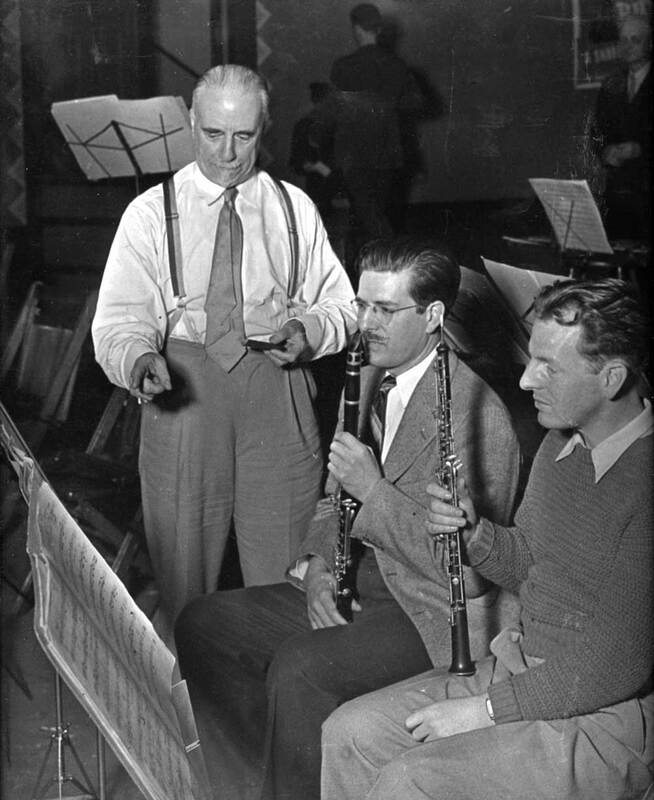 This rebellion was short-lived and the following year the organization was peacefully reunited under Milton Katims the Seattle Symphony Orchestra’s new resident conductor, a position he held for twenty two years. It requires no money to love a symphony, some money to hear one live, and lots of money to make one. In its 90th season the Seattle Symphony is quietly campaigning for a new auditorium. You do not have to be Heifetz to figure out that a culture which although it may resent paying athletes millions to play minutes in a big barn like the Kingdome will still do it and even scream for it, may not want to pay for a new concert hall where they will be expected to shut up and listen to a sound more profound than an electric organ. This symphony may have to resort to a technique used here during the Great Depression. Symphony Sunday: a fund raising technique used nearly 60 years ago, was proclaimed from the pulpits of the cathedrals, synagogues and chapel city-wide. The recording successes of the 1993 Seattle Symphony under Gerard Schwartz should also help. This was one of my favorite treasure hunts. The bureaucrats may disagree, but the romantic in me believes there are surviving elements of the original building hidden beneath countless remodels like some ancient ruin. Unlike most, I was never able to find any clear record of demolition or survival, and this building has a generous paper trail. In my opinion, the photographic record and existing profile is adequate proof. May I join your congregation as a votary? Naturellement! My regular Sunday devotional has included your sermons all these many years.